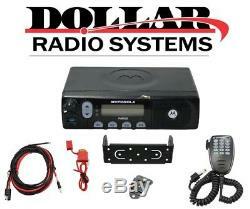 Motorola PM400 UHF 438-470Mhz 64Ch LTR Trunking Police EMS Racing Mobile Radio. New Old Stock Motorola PM400 UHF 438-470Mhz 25W Two Way Mobile Radio. 1 - New PM400 UHF 64Ch 25W. 1 - New Power Cable. 1 - New DTMF Mic. 1 - New Hang Up Clip. We accept all major credit cards and. We dont offer Overnight/2nd day Air. Please feel free to ask us any questions you may have before purchasing. _gsrx_vers_841 GS 7.0.16 (841). The item "Motorola PM400 UHF 438-470Mhz 64Ch LTR Trunking Police EMS Racing Mobile Radio" is in sale since Wednesday, September 27, 2017. This item is in the category "Consumer Electronics\Radio Communication\Walkie Talkies, Two-Way Radios". The seller is "dollarradio" and is located in Salt Lake City, Utah.